A note on Char and Dave's visit, it's about John and Henry. This is how they spent their evenings. Henry can really read. John can't. 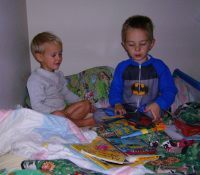 So Henry read to John in the top bunk, and they played cars. They compared each others jammies. Both agreed that Batman is pretty cool. Church started 30 miles away again at 8am and we had church services until noon. It's Reformation Sunday. And that means hearing all the names of those Levites that many cannot pronounce from 2 Chronicles 29:12-19. I think I should do a Bible Study on how to pronounce names in the Old Testament. It seems like that's one of the main reasons people give for not reading the OT very much. I tell them "They've been gone for thousands of years, they aren't going to care if their names are misspeaked." 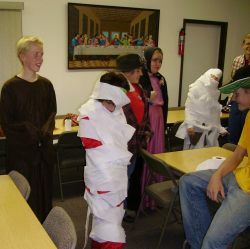 At 4pm we started the Reformation/All Hallows' Eve/All Saint's Day party for the Youth Group. Alison had worked up several games that made us all laugh so hard our sides ached. The one pictured here is TP the kid. Best coverage wins. That's Jake in the foreground covered in TP and Louisa in the background. You might think that Louisa was better covered, except that she was wearing a white blouse. Jake's team did a better job covering his red dress. Jake went as Miss America. 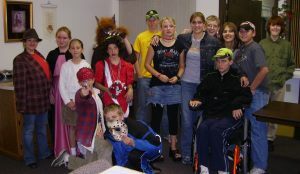 Afterward we had a group shot and picked the costume contest winners. We settled down for supper and had a study of the origins of All Saint's Day, and all Saints (Hallows') Eve. Just like Christmas Eve is the evening before Christmas, All Saints' Eve comes before All Saints' Day. The name from the Middle and Elizabethan English is All Hallows' Eve and All Hallows' Day. This was shortened to Hallow'e'en->Halloween. Modern Pagans and commercial vendors have hijacked the day. The Pagans have done a job by inventing false history and pretending that the Celtic festival of Samhain (pronounced "Sow-wan") occured on Oct 31. They further pretend that the Church tried to force the Celts to worship in Church rather than at their pagan festival by putting All Saints' Day on Nov 1. There are many problems with this historical farce. A fairly good article is available at wikipedia. First is that the Celts didn't have the same month names and days as the Church. They used a lunar calendar, not solar, for their festivals, so the date could vary as much as 54 or more days for Samhain. The autumn full moon was most likely their marker for the three day festival. Second is that Pope Gregory III (fl. 731-741) had recognized the day the Germans celebrated All Saints' Day and made it a universal practice in the Western Church. Samhain is Irish, not German. And it was the Germans who chose Nov. 1. Also see the wikipedia. Third is that the celebration of Halloween as a cultural phenomena is a modern invention in the U.S., dating from about 1905-1915. Candy sales have been the primary motivation. Ireland celebrates a similar festival, but that country's celebration hadn't been widespread until the 20th century. Likewise, the spread of "Halloween" to other countries is only now taking place in the 21st century. But the primary reason for Lutherans to gather is to commemorate the Reformation, Oct. 31, 1517, when Martin Luther nailed the 95 Theses to the door of the Castle Church at Wittenberg. Thus, beginning the Reformation of the Church back to the Gospel of Salvation through Jesus Christ alone as a gift of grace alone through faith alone, revealed to us in Scripture alone. And so through the Gospel of Jesus Christ we are dressed in His righteousness through Baptism and become Saints. Thus, we celebrate All Saints' Eve and All Saints Day best by celebrating that God has declared us justified by grace in Christ. Between children there can be a bit of competition. 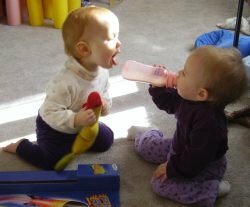 For example, here is Stella trying to get a bit of Grace's bottle. Stella wasn't too competetive though. She decided to let Grace finish up and went on her way to play with some other toy. With the giving of gifts is also the desire to play with some of the gifts. Char and Dave gave the boys each a pneumatic rocket for their birthdays. Soon we could see Dave testing them out. That's one of the great things about having kids. 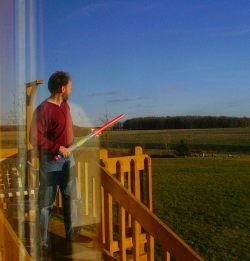 No matter what your age, you can still play with the cool toys, and not be ashamed. 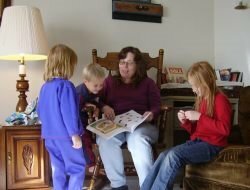 Char ended up having to spend some time reading to our kids as well. Some of the books that Char and Dave gave to the kids were puzzle books and workbooks. Hopefully John will use pencils on the workbook and not eat them. I wonder if he has some kind of graphite deficiency? 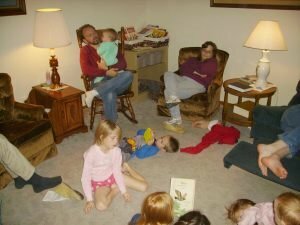 In the evening we would settle down for a bit of reading time. Since Char and Dave had just finished up Jonny Tremaine we didn't read from that. Mary had a couple of other children's books that we read during their visit.